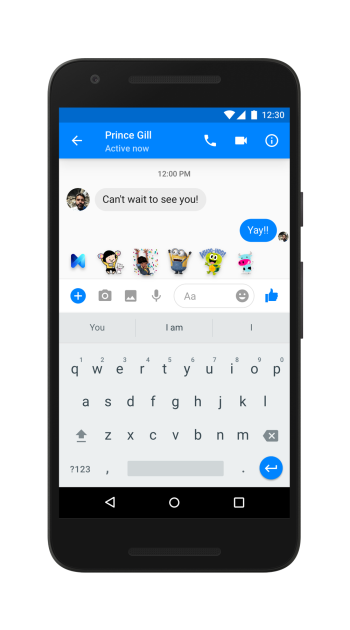 Facebook's artificial intelligence (AI) assistant, 'M,' will now help you discover other AI features within the Messenger app. As you type, M analyzes your conversation for keywords related to other features buried in the Messenger app. When M reads something in your chat that a feature can help with, you'll see a recommendation above the message composer. For example, if you type "Let's get together after work" M suggestions will show the Start Plan feature. Now you can uncover the full potential of internal Messenger features, like stickers, sharing your location, sending payments, and more. You can more easily hail a car with Lyft or Uber, which signals that additional external add-ons will be included in the future. M suggestions are going to make performing collaborative tasks much easier for users. Instead of having to open up multiple other apps and coordinate with everyone on a chat, M can recommend the internal features that do it for you. Because it is powered by AI, M will learn individual user preferences over time and suggest more of the apps you frequently use while de-emphasizing the ones you don't. Is Facebook reading my conversations? M suggestions is only artificial intelligence, and Facebook claims "no human ever touches" the data M sees. Still, if you don't want anyone, computer or not, poking around in your private chats (you should probably use Secret Conversations), you can edit the Messenger settings to mute M altogether or only certain features. The feature is being rolled out to iOS and Android users in the US now, and will expand globally over the coming months. The full version of M is still in invite-only beta, presumably continuing to learn how to provide more general assistance from humans. Read more about it on the Facebook Newsroom.